The new PHCN-85 is the latest edition to the pH/ORP meters from OMEGA. This transmitter and controller offers a large TFT color display and 32-bit processor/ARM core operation system. The PHCN-85 has two 4 to 20 mA outputs to control or retransmit the pH or ORP and temperature value. 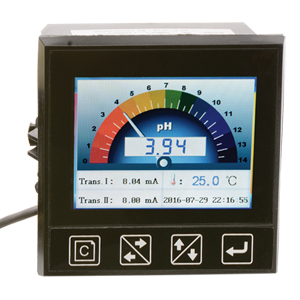 In addition, this powerful instrument has 3 relay outputs for pH, ORP, temperature or timing. The PHCN-85 is also packed with standard features like RS485 communications, a calendar function and password protection. The power supply input even has automatic polarity detection. Note: Comes complete with NEMA4 back panel and operator’s manual. Sensor sold separately.